Geez, how much will they go for? They do look lovely though! Oh I didn't know this. But isn't it cool to have blue roses? How much do these blue roses go for? I'm sure they are not going to be cheap. Thank goodness it symbolizes anything other than love. Can't imagine the price these will go for on Valentine's Day. @ LM - These roses are priced from $22-$33 but they may be more. They even can make many colours in one flower now. Amazing technology. @Willie - They do look very nice and it's reported that they have a pleasant fragrant scent too. Maybe Malaysia will get these blue roses before the U.S. does. A dozen roses cost around $7.00, these go for $22 at minimum?? Wow, that's expensive for a new color rose! 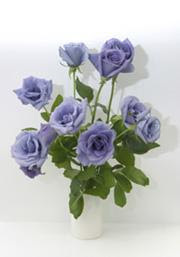 @Super: It took 20 years to successfully modified the rose gene to produce blue pigments to make blue roses. Technology can be great but also scary. I wonder what these geneticists will come up with next. Maybe for special occasion, I'll shell out that much money for roses. In the long run, I'm sure prices will fall as production of the roses become better. Blue roses are indeed beautiful. It is certainly much better and genuine than the white ones I saw in which their stems were forced to absorb blue dye. That's simply amazing. Shows what human determination and perseverance can do. I hope man will use this kind of determination and perseverance to produce products that will redound to the benefit of mankind rather than the destruction or suffering of humans. Thanks for the welcome post. God bless you always. @Mel: It is wonderous what advances in science can produce. I think advances in technology is only great when used with great morals. Look what the invention of the atomic bomb did. It brought destruction and deaths instantaneously. I just hope scientists don't alter the genetics of foods we eat and leave it to nature to give us what we are naturally meant to have. @Gratitude: When brother got married last year, his wedding theme color was royal blue and his florist used blue dyed roses which didn't look natural. He read my blog and said "should of waited to get marry next year". Yes, Confucius' three wisdoms quote is similiar to Buddha's The 4 Noble Truth. I liked it so much the first time I read it that I kept it with me for a long time. @Dora - I, too, prefer things organic and in their original form. Once things are modified in one way or another, they get screwed up along the way...at least, that's how I view science and technology trying to interfer wit nature. i have never seen a blue rose, my heart beat so fast in seeing the picture, i guess it got excited in seeing one rare rose, and the picture is so lovely. What a fascinating post. The blue roses are very pretty. Its amazing what science and technology can come up with, sometimes a little scary too! @Cheryl: Yeah, technology is good when used for the better of mankind. I just don't like it when we start messing with nature. Lovely roses... Never thought it could be genetically done.. and finally too :). @ladyviral: yea, it was someone's dream 20 years ago..i guess, and now it's a dream come true.